In the Tropical Spa and the Water Park of the Therme Erding no eye remains dry. Relax on the bubble loungers in the thermal healing water of the Tropical Spa or let yourself drift in the large wave pool. 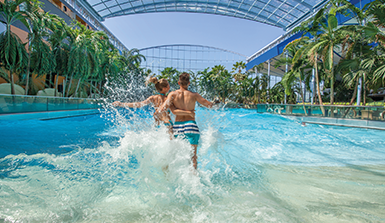 In the 34 degree warm wave pool with waves up to 2m high you will feel like on holiday by the sea. Even more action, fun and excitement awaits you at Galaxy Erding. 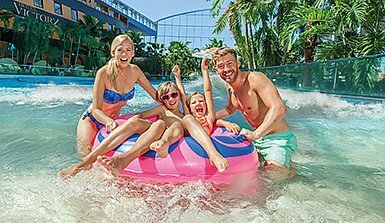 With 27 incomparable slides, Europe's largest slide world offers unlimited fun on 2,700 metres of slides. In addition to numerous water attractions, a varied health & beauty programme pampers guests daily with invigorating aqua courses, nourishing face masks and cleansing body scrubs. Europe's largest openable glass dome provides plenty of light and a year-round summer feeling. For what could be more beautiful than to devote yourself entirely to health, well-being and beauty in a paradisiacal ambience? Experience (or give away) wellness for the senses - this is where relaxation begins! Here you will experience 365 days of summer under the palm trees - perfect for a day trip or short break with the whole family. Look forward for slide racing, let yourself be carried away by our up to 3 meter high waves in the wave pool or discover our action programs with water aerobics, volleyball and much more. Our entrance vouchers are available from just 18 €.